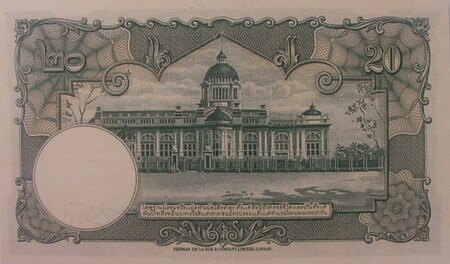 The 9th series 20 baht type 4 banknote is identical to the 20 baht type 3 banknote. But the note has a security thread instead of color silk fibers as it was in the 1st - 3rd series. Even though each type of 20 baht 9th series banknote is quite similar, the different points of the 20 baht type 4 banknote are the portrait of King Rama 9 in older of age and the serial number that is printed in black color as well as a security thread. And the watermake image is the constitution placed on pedestal tray. 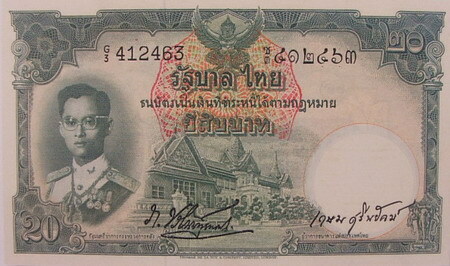 The 20 baht type 4 banknotes were announced on 18th September 1956. The main object is the image of King Rama 9 in older age in the uniform of the supreme. The middle image is Dusidapirom pavilion and Chakri Maha Prasart throne hall. The serial number is printed in black color. There is a security thread. And the watermake image is the constitution placed on pedestal tray.